It is officially autumn and the two vases I’ve made this week reflect the crossover of the seasons. The first is a slot-necked pocket vase that was handmade by artisans in Ecuador using a wax-resist technique that results in textured glazing. After seeing Cathy at Words and Herbs sunflower vase a few weeks ago, I remembered this one and wanted to feature it. Slot-necks are tricky to use because the stems tend to flop left and right with few left in the middle. I fixed the problem by using dried hydrangea blossoms (H. ‘Annabelle’) to hold in place the yellow and salmon zinnia stems (Z. ‘Profusion’). Fountain grass (Pennisetum alopecuroides) provides a nice harvest accent. The rusty tea towel and orange-tinged seashell compliment the arrangement. The second vase is a solid, glass-crystal block that a dear friend from Colorado sent me last week as a surprise gift and I couldn’t wait to try it out. I picked dried seed heads of daylily (Hemerocallis sp.) and yarrow (Achillea millifolium) tucked in with more hydrangea. Experimenting with contrasting live green material, I used the fern-like leaves of cecily (Myrrhis odorata) and a small sprig of goldenrod (Solidago sp.). The hand-carved wooden cat was given to me many years ago by my son. Her suggested theme this week is Simplicity or Abundance. Wander over to see what gardeners all over the world are arranging this week. 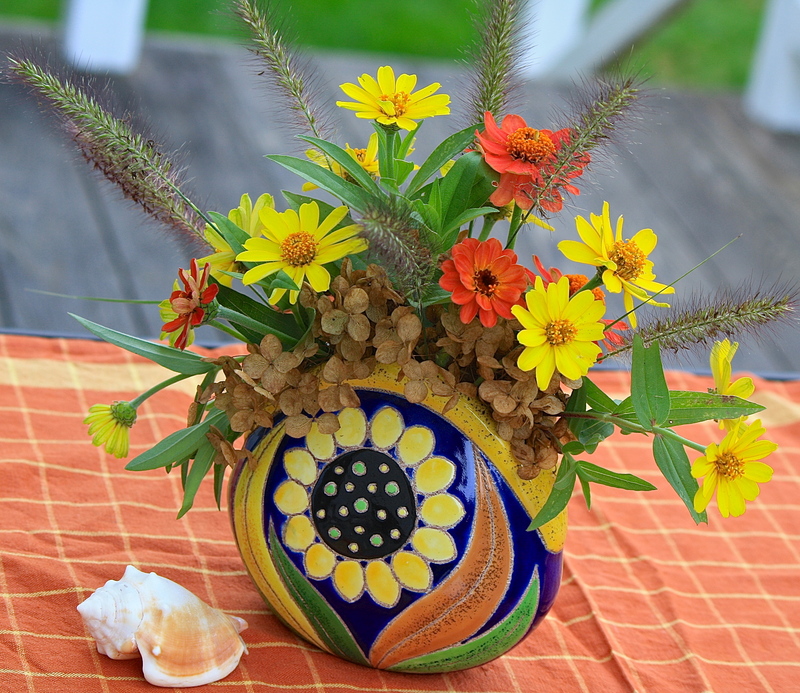 Feel free to join in, sharing your own weekly vase with a link to Cathy’s blog. 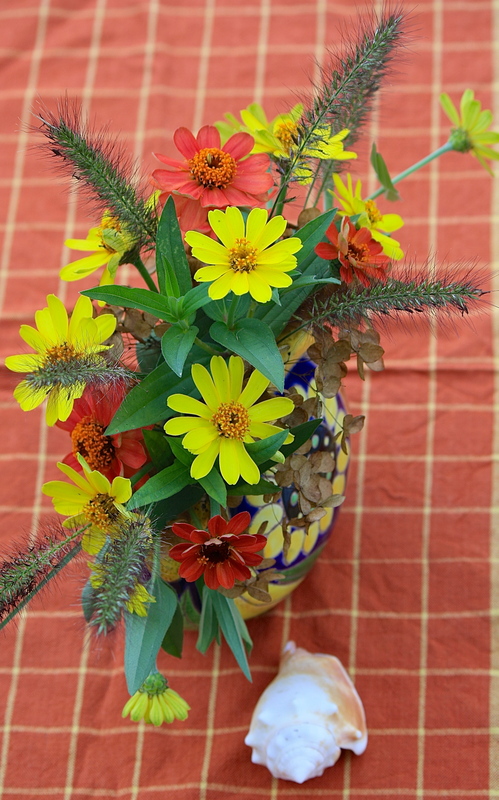 This entry was posted in Country Gardening, My Photos and tagged dried hydrangea, dried yarrow, flower arrangement, gardens, hemerocallis seed pods, In a Vase on Monday, meme, myrrhis odorata, Pennisetum alopecuroides, photography, Weekly Vase Challenge, zinnia 'profusion'. Bookmark the permalink. The design of the first one is wonderful! I like the second as well. 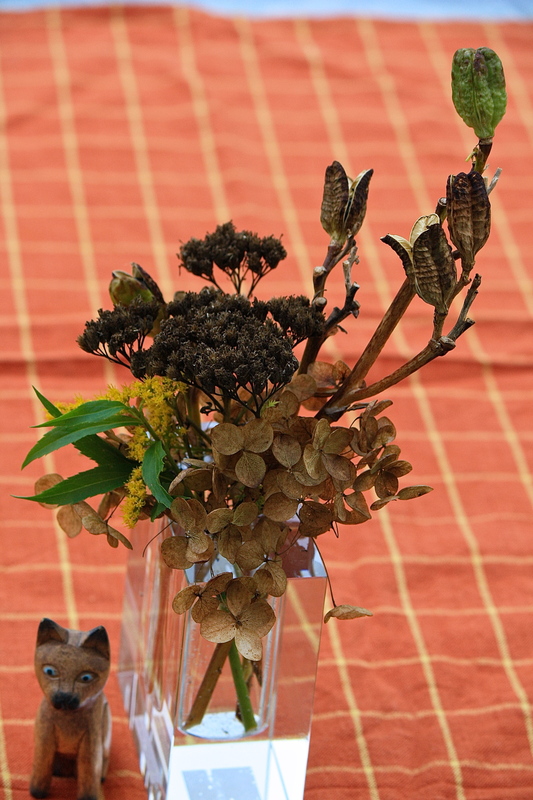 It is great fun to bring in seedheads and dried leaves. Sigh* Temps have really dropped here, all of a sudden. I’m thinking it is time to put storm windows on already! More inspiration! I’ll soon be bringing in seedheads and pods. I wonder how zinnias would do in a pot. Do they need full sun? Zinnias need really strong sun (think Mexico), but everything is worth a try, I suppose. Look for any pests (give a strong spray with the hose) to avoid bringing any bad guys into the house. Unfortunately, by December our sunlight is pretty pitiful! Oh, sigh! I had that funny feeling. Six hours of sun probably wouldn’t cut it for zinnias. 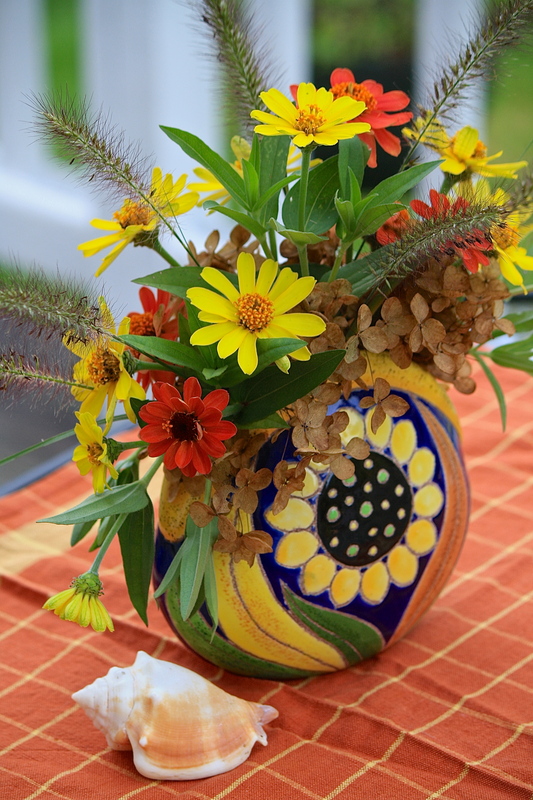 Fabulous sunflower vase…quite lovely and the flowers you chose are perfect for it…I love its shape. The seedpods are perfect for fall. I can’t imagine a more perfect pairing of vase and flowers than your first arrangement, Eliza! Ooh, what lovely colours! I do like those Zinnia shades and your vase is gorgeous – yes, I see the resemblance to my sunflower vase (thanks for the mention again 😉 ) The second vase is a work of art Eliza – it makes you stop and look more closely and appreciate what is in it and the thought that went in to it too. Thank you so much for your inspiration and kind praise, Cathy! The slotted vase is so lovely, Eliza, I can appreciate all the technique that went into the design, since I have done pottery. It looks great with your zinnias, and I like the Hydrangeas and grasses for the fillers and proppers. 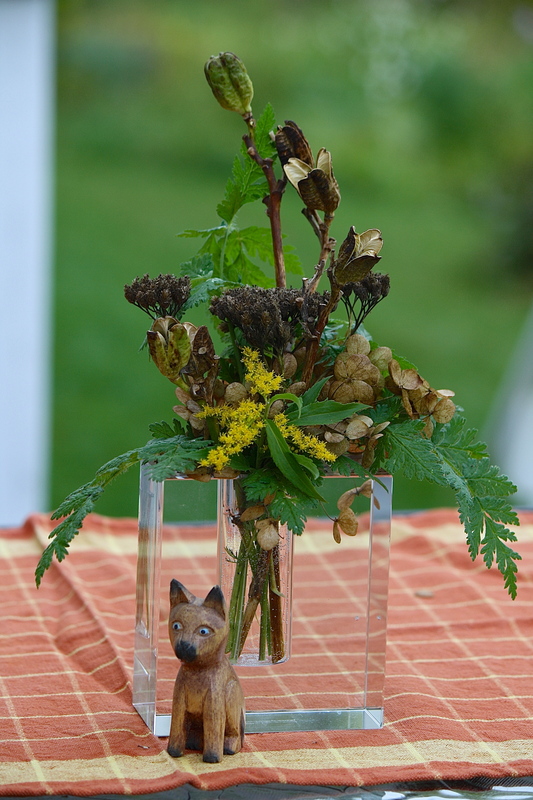 The small glass vase is the spirit of Autumn, with the spent seed heads and browns, greens, and yellow of the goldenrods. Thank you very much for your kind comments, Hannah. The artisans at Artesa, S.A. do a great job with their ceramics. My spouse was a US rep for them many years ago and we have several beautiful pieces that are really works of art. Thanks, Lisa. That clear vase is challenging to get right. I need to try it a few more times to figure out how to show it in the best light. Ah, photographing the flowers is another thing entirely, something I have not mastered. The clear vase arrangement was lovely, but that second element on view adds something else to the calculations. Wow. wow. wow. These are amazing. You truly have a gift. 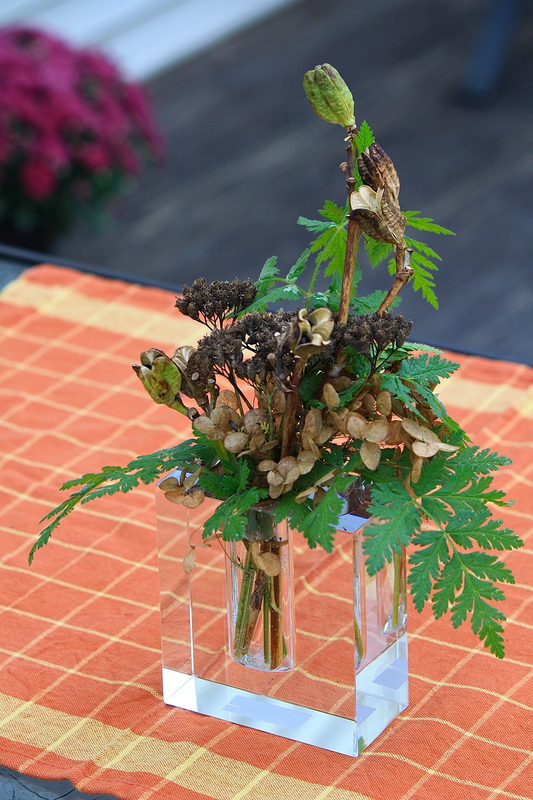 I really like the dried flowers – it gives it a very fall feeling for me. My personal favorite are empty milkweed pods once the seeds have flown.The interiors are satiny gold. Lovely! How bright and beautiful. What a good idea to use the hydrangea to hold things in place. It looks like a lacey collar. The colors blend so nicely and are so harmonious. I’ve not experienced the autumn season fully. When I was younger I went to NJ and it was gorgeous, but I was not into flowers then. I know New England is is one of the nicest, and most colourful areas! Thanks, Maria. I’m hoping that our foliage is nice again this year. Rain and wind can have a dulling effect. So fingers crossed! My, not only do you have a beautiful collection of flora and fauna, but quite a stunning collection of portals! Love! Thanks, Ann. Yes, it is that time of year! Beautiful arrangements Eliza! You are giving me inspiration to bring some Colorado woodland clippings into my new house. Thank you – absolutely, bring ’em on in! Beautiful colors & vase! Your extensive knowledge on colors and arrangements and things is amazing!! Your crystal block vase is gorgeous and that is sweet of your friend to send you a surprise! I think I said this before but that is a great idea that this lady, Cathy, has to come up with different concepts and showcase all of your arrangements each week! 😀 It brings more beauty and joy into the world! ❤ And I'm a Fall fanatic and love this Fall theme!! Oh, so so pretty, Eliza! The vase is stunning and the flower arrangement is perfect. I wonder what the yellow flowers are? I have similar flowers in my yard. 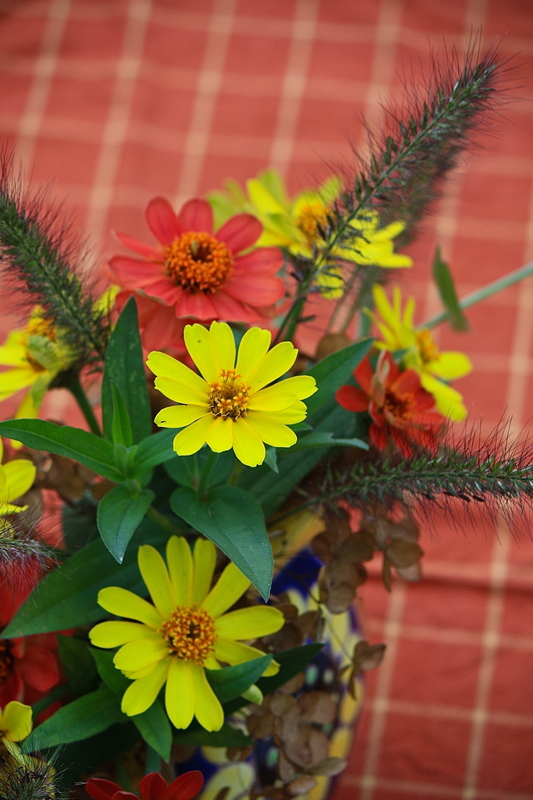 The first vase has Zinnia ‘Yellow Profusion’ (a GREAT garden performer) and the second has a sprig of goldenrod.